Africans are one of the fastest growing immigrant groups in the United States, yet their presence receives very little attention in public discourse about immigration. In an era where America’s immigration policies have grown increasingly insular, African immigrants are particularly at risk of having measures that historically facilitated their entry into the United States, stripped away without recognition of the benefit they pose to them. This Note argues that the intersectional identity of Black African immigrants, being Black and foreign, renders them effectively invisible in the immigration debate and vulnerable to policies that affect them both due to their Blackness as well as their status as foreigners. It proposes that the Intersectionality framework can serve as a useful tool to shed light on the unique concerns of African immigrants and create policies that directly address them. Part II of this Note provides a background into the history of African immigration in the United States. 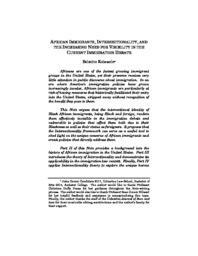 Part III introduces the theory of Intersectionality and demonstrates its applicability in the immigration law Context. Finally, Part IV applies Intersectionality theory to explore the unique harms that African immigrants face in the current Immigration landscape.